Allen and Pike Street. Photo: NYC DOT. 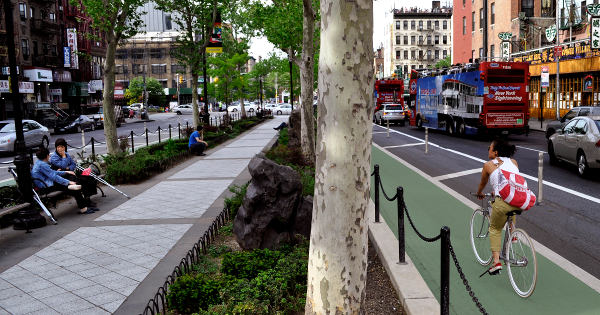 The city that brought modern protected bike lanes to the U.S. is still at it. New York City, like Seattle and Vancouver BC, continues to show how consistently successful a city can be at improving biking when it faces down a bikelash and keeps on going. The street-level political fights continue, of course. And there’s always a risk that the tide could turn. But like a toddler who has already scratched her way through chicken pox, a city that has beat an anti-biking backlash seems to have antibodies flowing through its political discourse. No, the commercial strip did not collapse. Yes, you can still find a parking space nearby. Nobody’s car was taken away, more of us just got a chance to leave one at home. When the cool, solid facts are on the ground, they reveal a low-stress bike network for what it is: A relatively cheap and effective way to improve city streets for everybody without significant harm to anyone. Maybe that helps explain why New York City just said it’s planning to make 2016 its biggest year yet for protected bike lanes, breaking the record it set … in 2015.